Timothy Fosu-Mensah's 29th-minute own goal separated the two sides. 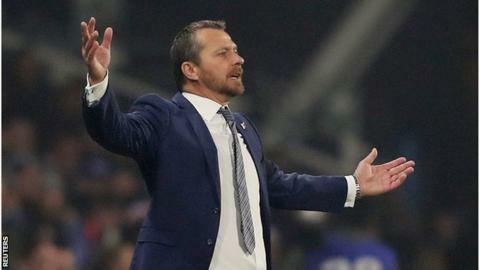 Jokanovic added: "I know in this kind of situation many things can happen, but it is outside of my control. "Other people, if they need to say something, they can use some words." "They must fight - this is a tough competition," Jokanovic continued. "There are 27 games ahead of us. We didn't show a positive reaction against Huddersfield - we must be brave and look for improvement. At the moment it is not enough at this level and it's in our hands. "We know we can play better, show more intensity, be more solid and win the game." He added: "My players had some words after the game between themselves, but it's a little bit late. "We had the opportunity to do our talking [on the pitch] between 8 o'clock and 10 o'clock and we didn't talk with enough personality, power or quality."